MBA the nonprofit way | MBA + nonprofit work = ?? School at Johnson is now in full swing, and I can confirm that what everyone says about bschool is true: There just aren’t enough hours in the day to do everything you want to do. I thought I could still maintain some semblance of normalcy once school started, but no. EVERYTHING has changed! I’m sure that’s not true for everyone (especially if you don’t move to attend school or if you’re not doing a career switch), but it certainly is for me. I’ve changed my home, my financial situation (omg, the loans! ), my long-term goals and my overall attitude towards work and career. It’s kind of mind-boggling. And it’s also true that your time as a student generally breaks down into three categories: 1) Classes/studying; 2) Career Prep; and 3) Social life. And it is quite simply impossible to do all three to their fullest. Something has to give. Each person has his/her own priorities, so choose wisely. And, of course, all three are interrelated, so it’s certainly not a good idea to put all your effort towards one. Anyway, back to the thing that prompted me to write this post: I was recently profiled (for the second time–previous interview here) by Accepted.com. But this time, I did not interview anonymously. Anonymity is much less important to me now that the application process is over. I also believe in everything I wrote on this blog. I may have grayed out/generalized some details about myself just to keep the anonymity going, but that’s pretty much it. Before I link to the profile with my real name on it, let me ask you a question: Have you ever fallen in love with a radio host or DJ and thought they were the most charming, funniest and awesome person in the world? And then did you Google them and see their photo and find out what kind of person they actually were? And did you feel the wave of disappointment wash over you afterward? Now, I’m not saying that any of you out there are fans of me like that (not at all! ), but there’s something about anonymity that lets us make up a picture in our minds of another person that’s really…fun! Honestly, I wish I hadn’t taken the time to find out more about some of my favorite radio hosts/bloggers/etc. It was just more fun and satisfying without all the details. But hey, here’s the link to my interview if you still want to know. OK, this is really delayed, but a BIG thanks to everyone who voted for my blog for Clear Admit’s BoB awards! It was really exciting to receive the news that it placed second after all the votes were tallied. I’ve been overall very un-strategic about this entire blog (I never even installed Google Analytics on it…I’ve just been glancing at the stats that are automatically provided by WordPress…and I never went beyond this plain gray stock template design…the marketer in me shudders with horror), but it’s been really fun swapping stories with all of you over the last several months. And I guess I am a dirty liar. I was really planning on continuing my posts until fall semester started, but then I had to pack all my stuff into boxes and figure out where I was going to live in Ithaca and apply for pre-MBA camps and do accounting prep work and do mbamath.com and…well, you know where this is going. I’m full of excuses! As I previously mentioned in a frustrated post, I think there is a clear double standard when it comes to for-profit work and non-profit work, and non-profit work is valued at a much lower level. It’s funny, because when I share this thought with different people, some say “What?? That is NOT true” while others nod and say “Yeah, well, duh.” (The former response usually comes from fellow nonprofit-ers and and the latter from those in the corporate world. Shocker.) Whether that is warranted or not, it’s the framework I’m working in, so I’m going to do what I have to. I have found it near impossible to transition into the corporate world on my own with my 100% nonprofit background, so I’m considering bschool my one and only chance to make the move and get corporate experience. I have never had to really deal with money. There was either a static amount of grant funding or there was…no funding. Working in the corporate world will help me fill my knowledge gap about that. I’m curious. Will for-profit world be that different than what I’m used to? Will everything seem so bottom-line-focused and efficient and fast from my nonprofit perspective? Will working for profit crush my soul, or when it comes down to it, will it seem like any other work day? All in all, I hope this blog gives hope to folks with a nonprofit background out there who are applying to bschool. My biggest anxiety about the whole process was not knowing what my chances were or how adcom members would view my file. I felt like such a weirdo. But fear not–there are plenty of “weirdos” in bschool! At some schools more than others, of course. If you’re in nonprofit, I encourage you to look for schools that value your perspective instead of trying to fit you into one of their prefabricated boxes. That’s how Johnson felt to me, which is also why it feels like home. I’ve been nominated for a BoB! Wow–I am honored to be nominated for Clear Admit’s Best of Blogging 2013-2014! I’ve really enjoyed writing here over the past several months, and it’s always wonderful to hear from any of you through comments and emails. I hope my experiences have helped your own journeys. I love how the bschool blogosphere and online community feels small even though people from all over the world are active participants. You can help me turn my nom into the real thing by voting for my blog and two more of your favorites. And a shoutout to all my fellow nominees below! I think you should also vote for hamm0 over at Boots to Suits. Cuz, you know, Johnson ❤ all the way. I’ve been spending way too much time shopping lately. And I don’t even like shopping…it’s mostly a chore to me. One of the drawbacks of Ithaca is that there isn’t easy access to clothes options there, so I’m trying to get all that done before I get to Cornell. For me, that’s involved buying suits from Banana Republic during their “40% off everything in store” days and hopping into DSW for black heels. And then dropping everything off at a nearby tailor to get all the pants hemmed to the height of my new shoes. Being a short woman is expensive. But I’ve spent most of my shopping efforts on finding a school bag. I don’t like backpacks, so I’ve been looking for totes. 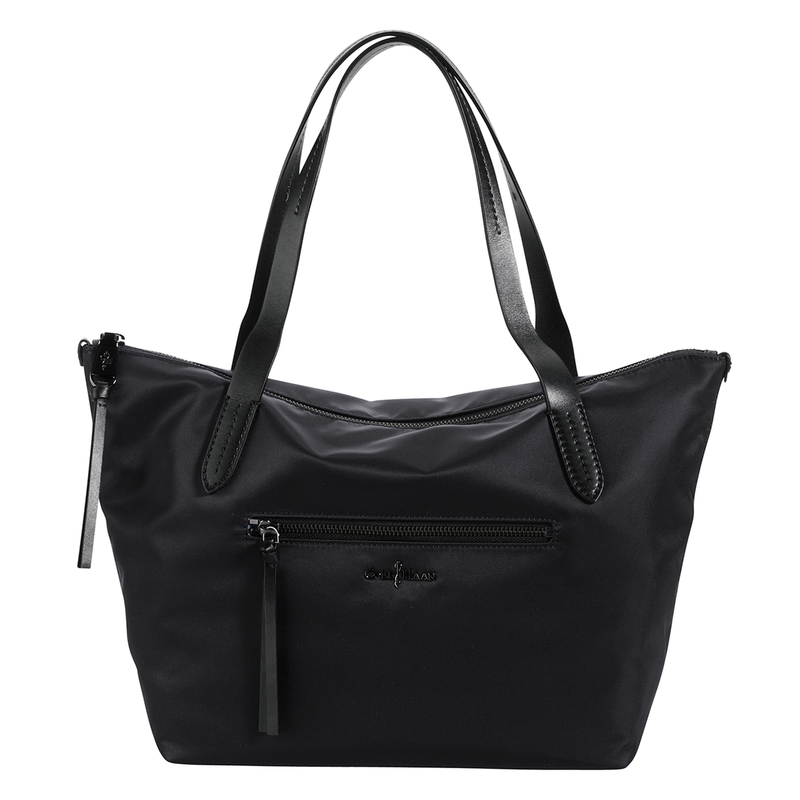 I have a black nylon tote from Gap (that I realized was basically a Longchamp Pliage knockoff many years later) that I’ve used for the past….13 years. Yup. I used it every day in college and for traveling afterward. Needless to say, it’s falling apart and pretty gross looking now. But I can’t argue with the value! Those $20 were well spent. When I first started my search, my first thought went to getting the real Longchamp Pliage tote. But then I couldn’t stand the idea of spending $150 on something I spent $20 on previously, even if it wasn’t really the same thing. Plus the Pliage is literally a sack with zero side pockets or anything. My bag would be a purse replacement, so I need nooks and crannies for keys, phone, wallet, etc. I’d also need something big enough to fit my 15″ Macbook Pro. This bag met all my requirements except one: Price. Too expensive for my taste. But pretty much great all around! A great buy if you have the cash. 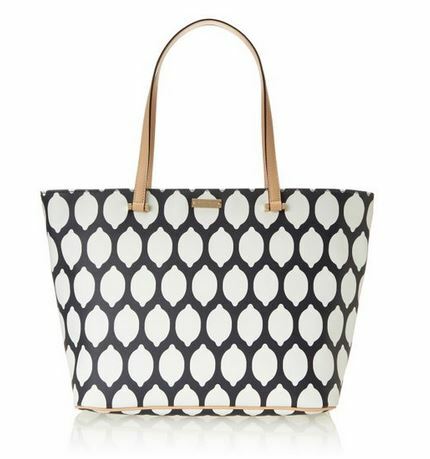 A really cute bag with a decent sale price. Something about how the vinyl gave it a bowl-like shape didn’t agree with me, though. But if I see you with this bag, I will definitely tell you how much I love it. 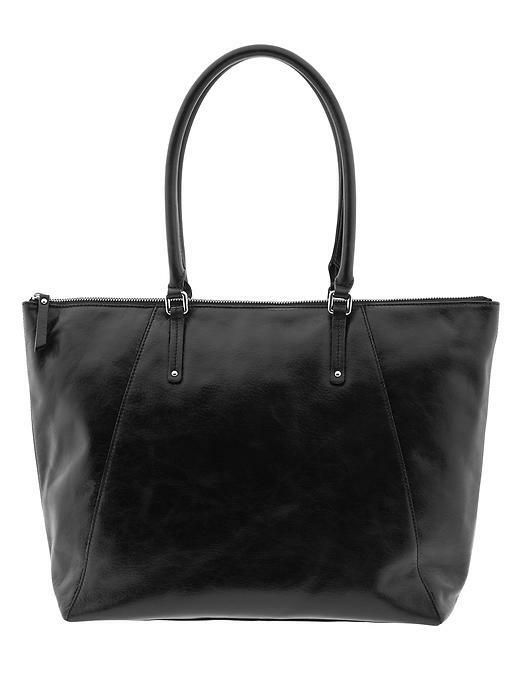 I actually bought this tote during a major sale for $80 thinking it would be the winner, but once I received it I saw that the leather was not the best quality. It also has a feel to it that made me think that it wouldn’t last very long. And after my 13 years with my last black tote, I’m spoiled. I returned this one. 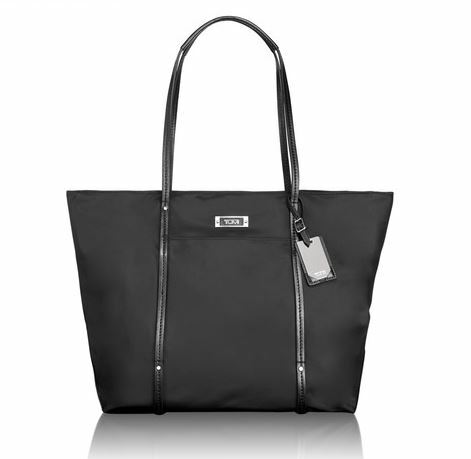 I came across the Tumi Q-Tote early in my search and loved it. It was perfect: I liked that it was made of indestructible nylon, had lots of little pockets and thin, flat straps (round ones always roll off my shoulders) all while looking somewhat classy. But $225?! No way, no siree bob. Then I hopped into Marshall’s one day and dug around the purse section a bit and found buried treasure. A single, dark blue Q-tote behind a stack of other bags marked down to $125. After a bit of mulling (“Am I really going to spend over a hundred bucks on a nylon bag? ?”), I bought it. I’m still kind of horrified that I spent that much money on it (I mean, come on…how much did it actually cost to create this thing? Ten bucks? ), but I’m hoping that it will beat out my last 13-year streak. This is one of those classic books that you can’t regret spending the time consuming even if you don’t think it’s that helpful. It’s a cultural phenomenon! Check out the Wikipedia entry for all the bullet points. I use the “ask people questions about themselves” technique a lot. As an introvert, I find it easier when others do most of the talking, and getting people to talk about themselves is the best way to do it. I have to say that reading the book was kind of depressing, though. It makes it sound like we’re all self-centered, compliment-guzzling, insecure children who are desperately seeking attention from any source. But I guess it’s basically true! 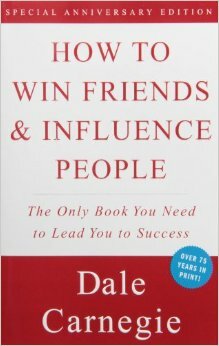 Why not study the technique of the greatest winner of friends the world has ever known? Who is he? You may meet him tomorrow coming down the street. When you get within ten feet of him, he will begin to wag his tail. If you stop and pat him, he will almost jump out of his skin to show you how much he likes you. And you know that behind this show on affection on his part, there are no ulterior motives: He doesn’t want to sell you any real estate and he doesn’t want to marry you. READ IT. I’m glad I listened to this one and checked it off my list. I just finished drafting my resume in the Johnson format. Besides the utter torture it was to format it in 11 pt Times New Roman in a Word doc using tables (I work on the side as a freelance graphic designer; I haven’t had my resume in Word since 2003), the worst part, by far, was figuring out what to put in that dreaded “Personal” section at the bottom. I know everyone says to not stress out about this section. But then the next moment I hear that it’s the first part of the resume recruiters look at. And how am I not supposed to worry about this section, exactly?? I’ve never, ever had a “Personal” section on my resume. I always thought it was irrelevant, and I’d much rather use that space to talk about my professional qualifications than what I do outside of work. Plus, it’s no one’s business what I do with my free time, right? The last thing I’d want is for a recruiter to make unfair assumptions about me due to the content of that kind of section. I’d really rather avoid it, but it’s apparently expected. So I’m stuck. OK…I don’t know about all of you, but I don’t do these things. I don’t run, period. I also don’t ski or snowboard or play basketball, soccer, golf, cricket or any other sport. The closest thing I do to physical activity is hiking, and that’s the LA definition, which means walking lazily along a smooth and wide dirt path for a mile or so before you start to feel a little hot and then turn around to go back to your air conditioned car. So I started to think hard about what I do with my free time. And, honestly, I spend a lot of my free time reading. And no, I’m not reading Victorian poetry or amazing pieces of literature. I’m reading…The New York Times. Slate. Mental_Floss. The New Yorker. A bunch of local SoCal blogs and a huge slew of tech blogs. The thing is, putting “reading” down on your list of personal interests is probably the most boring non-informational thing you could share, even if my reading goes beyond leisure. I thought about including something like “animal rescue” or “animal advocacy” on my list. But I am completely paranoid of someone reading that and assuming that I am some kind of PETA militant or someone who lives with 20 cats. Then I considered adding “cooking” or “baking”. I’ve done a lot of cooking in my life and am pretty much a foodie. But that also sounds bland and generic nowadays; it’s closer to “reading” than anything. 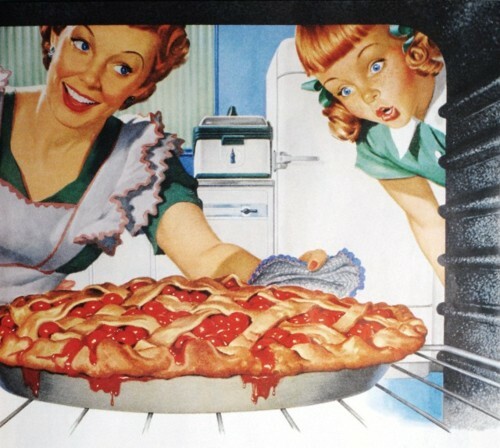 “Baking” could possibly be more interesting, but once again, I’m worried that it will sound like I’m a woman who wears an apron and bakes cookies for her children in her 1950s kitchen. I do bake a lot, though. Let me know if you need any cookie recipes–I’ve tested out a lot on my officemates. Frankly, the other stuff I do just sounds weird. I like to write, of course, and have written a good amount of poetry and fiction. But that seems…I don’t know…too “heavy” to include on a resume. Like maybe I’d actually really rather be a novelist but I’m looking for a regular job to pay the bills (which is not true). I also like to find/play indie/offbeat video games, which totally sounds weird. And it also sounds like I’m a gamer or something, which I’m not. Real gamers would kick me out of that club very quickly. SIGH. I wish I did something relatively common and relatable, like photography or painting. That would be pretty safe. I mentioned earlier that I love audiobooks. I’ve decided to spend all of my listening time from now on on various business-related books, which is a huge change for me. I really prefer fiction, especially sci-fi, horror and YA (I was making my way through a ton of Stephen King before making this switch). Anyway, I thought I’d jot down some pseudo reviews and thoughts on what I’ve been listening to lately on this blog. This book is apparently a follow-up book to The McKinsey Way. The only reason I listened to this one instead of the original was because The McKinsey Mind was available on audible and The McKinsey Way wasn’t. 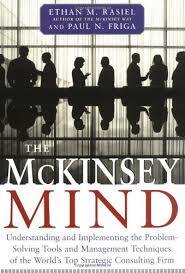 […] Let The McKinsey Mind show you how to approach and solve problems with the skill of a McKinsey consultant and obtain the positive results that have been delivered to McKinsey clients for over a century. The McKinsey Mind is full of lame unhelpful platitudes like “Don’t boil the ocean.” It also offers gems like, “Give your clients advice tailored to their business.” Wow, really? You mean I shouldn’t treat a small business and and multi-million dollar international conglomerate the same way? Thanks for the tip. The book completely lacks in applicable, practical methods or analyses, which is weird, because that’s exactly what the book promises to deliver. One reviewer on Amazon wrote, “If this were a book on picking stocks, the equivalent would be ‘buy low, sell high. '” I don’t think I can capture it any better than that! SKIP IT. Maybe The McKinsey Way is better? I won’t be attempting it, though. Let me know if you do.